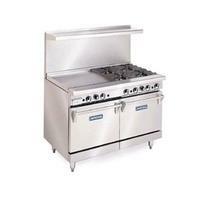 The center of most commercial kitchens is the range. This item will be used all day, every day so it is integral to the success of your business that you select the right one for your particular application. 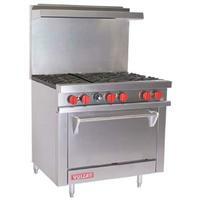 Open top gas burners are the choice of most professional kitchens. They provide an instantaneous and visible heat source that can be easily controlled and regulated. Gas burners are usually much cheaper than electric burners and provide faster heat to a cooking vessel. Griddles consist of a flat metal plate made of steel, cast iron or aluminum and food is cooked directly on top of the griddle’s surface. The large amount of open space allows the user to cook numerous items simultaneously, ideal for customers who want to prepare various types of foods very quickly. 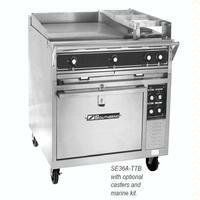 Units, such as the 4484EE-2TL, can be configured to have BOTH burners and a griddle section. Keep in mind that most manufacturers offer this flexibility which can save you money and space in your kitchen. Storage: If no additional cooking space is needed it can be a great money saving idea to opt for an oven with a storage base. Standard Oven: By far the most common selection. Standard oven offers the flexibility of having a cooking cavity but the affordability not offered by convection ovens. Convection: Although the highest initial cost, convection ovens use fans in the oven cavity to circulate air. This allows for even cooking which results in higher quality finished product. It also allows for shorter cook times which means faster production out of your kitchen.